Losing Wednesday to the Pistons equaled the franchise's worst record, 17-65. The NBA's worst record gives the Knicks only a 14-percent chance to land the No. 1 pick. Clearing a massive amount of salary-cap space will create the possibility of adding two top-tier free agents. 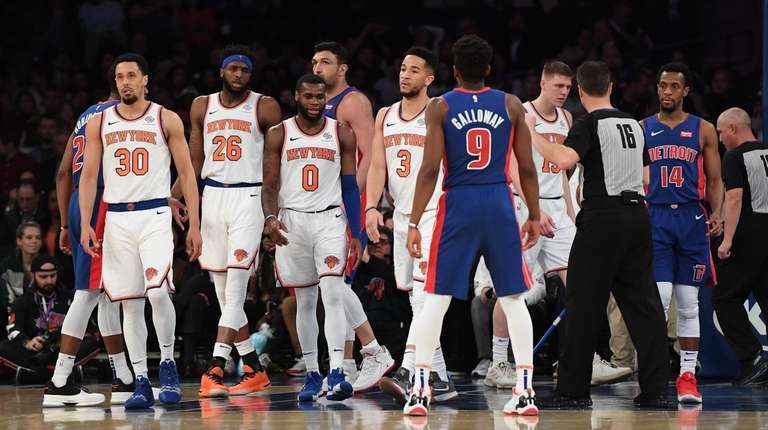 The Knicks held Fan Appreciation Night Wednesday as fans crowded in one more time to watch what had been the basketball equivalent of a particularly grisly groundhog day, night after night, loss after loss, the same result. Before the game, rookie Kevin Knox took the microphone at center court and in the spotlight thanked the fans and promised better days ahead. The Knicks took the last step of slogging through a 17-65 season, a 115-89 loss to the Pistons. The team had already endured a stripping of talent, bringing into focus the reality that this was a path aimed toward the NBA Draft lottery and not the playoffs. This loss, which matched the worst record in franchise history, set four years earlier, was just the last humiliating moment. David Fizdale, the first-year coach, tried either to put one last lesson in place for the NBA’s youngest team or to cover this garbage dump with one more fresh coat of paint. He told his team that the final seven games would represent a playoff series for them. They split the first six. The reality was that of their three wins, two were over the Bulls, with a roster made up mostly of players who had been in the G League days earlier. The ofther was against the Wizards, who seemed determined to remove anyone from the mix who could help them win. The Knicks never led in this game, trailed by 16 in the first quarter and by 40 before being put out of their misery. The closest thing to a playoff game was the appearance of Red Panda, the longtime halftime attraction. Even the highlight they point to nightly, the blocked shots of Mitchell Robinson, came to an end as he didn’t block a shot for the first time in 39 games. But Fizdale was taking his optimistic outlook to the final day, choosing to ignore the record and look instead at day-by-day teaching and player development. When the Knicks were mired at 14 wins and seemed unlikely to match the 17-65 record, he insisted he didn’t care about the record, and even when they matched the 17 wins Tuesday, he didn’t change his story. Fizdale already held his exit meetings with players in recent days. That left team president Steve Mills and general manager Scott Perry to handle the real point of their exit meetings, waving goodbye with a hearty thank you to the players who had lived through this season and almost certainly would not be back. In Fizdale’s exit interviews, he provided instructions for the players who seem likely to return and for those on their way to other spots after serving as roster fillers until this summer’s massive cap-space clearing. Now what awaits the Knicks is the lottery on May 14, when they will find out if all of the losing pays off. With the NBA's worst record, the lowest they can pick is fifth, but they have just a 14-percent chance of getting the top spot, the same chance that the Suns and Cavs have. Then it’s on to the free-agent chase that will determine the Knicks' immediate future. Garden chairman James Dolan spoke assuredly last month that the stars would come. While Mills and Perry have tried to dampen the pressure to get Kevin Durant, Kyrie Irving or whatever star will end the playoff drought, the plan is clearly to make a splash in the free-agent market.